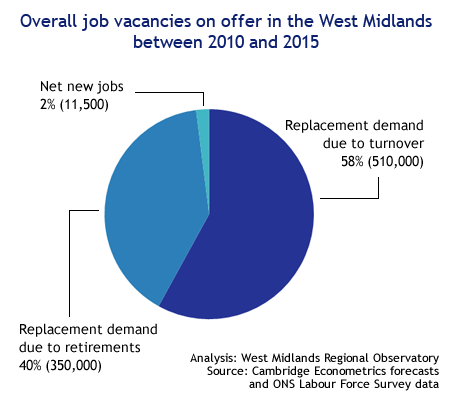 Updated monthly data on the West Midlands labour market were released today by the Office for National Statistics. Unemployment in the West Midlands has fallen — by 66,000 people over the last year, and 27,000 people in the last quarter. There are, however, 59,000 more unemployed people in the West Midlands than in February 2008. Unemployment has fallen faster in the West Midlands than anywhere else in the country over the last year and in the last quarter. However, unemployment rose more sharply here than elsewhere earlier in the recession, so essentially this is a rebalancing of employment levels. We’re not out of the woods yet. Employment levels have not yet reached their pre-​recession levels, and we’re expecting a significant loss of public sector jobs in the coming months, which could wipe out the recent drop in unemployment altogether.